When Rebecca’s market tent rose up, blew north, tipped, landed legs up in the parking lot, I knew it was trouble. The tent was followed by a paint can filled with 40 pounds of concrete, painted bright blue. Attached to the tent by a rope, it flew into the air and landed like a dead fish in the nylon blue waters of the tent’s canopy. I thought: Someone is going to get hurt. On any other Saturday that tent and paint can would have smacked into two or three cars, but for whatever reason, at that moment, no cars. And Rebecca, her daughter, and her daughter’s friend were all okay, perhaps a little stunned. I could do nothing but gape. My tent was trying to fly away, too. Ah, another fine end to another fine farmers market. 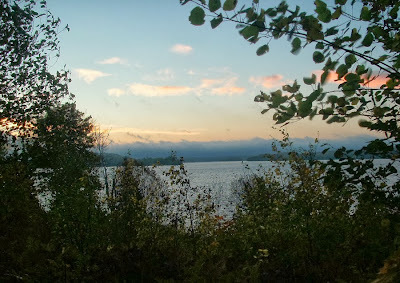 On my way to the market I had dawdled at a rest stop on the north side of Lake Michigamme. The view just before sunrise. 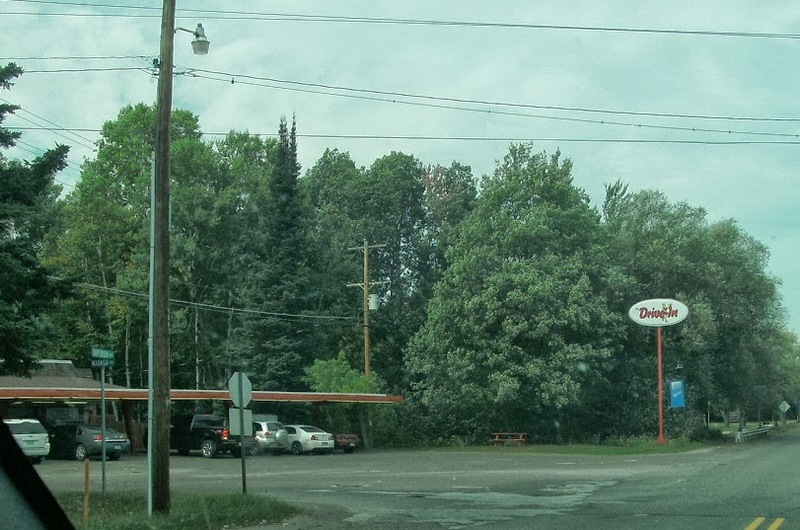 I arrived in Marquette a bit later than usual, got set up, soon the market was bustling. It was sunny, warm, and as predicted, windy, but the wind was manageable, causing no greater harm than an occasional bag or scrap of paper getting caught up in its frenzy, blowing about. I swear I even saw some dollar bills floating by. Overall, it was a rather jovial day. Early on, the husband of the maker of the best cinnamon rolls in the world planted the thought of cinnamon rolls in my head using this very effective method: “Hey, we have cinnamon rolls today.” For the next hour or so, try as I might, I could not shake the thought of cinnamon rolls. I listened to stories of Rebecca’s goats and cats and ducks and beagles and something to do with swans and an eagle, but I was a poor listener because I was thinking about cinnamon rolls. I sold candles and talked to people and finally, realizing I was telling a customer how I could not get cinnamon rolls off my mind and how I was really trying hard to get cinnamon rolls off my mind because later I was going to have a root beer float at The Drive-In, having seen in the paper that The Drive-In was closing for the season after this weekend, I said, “So what? It’s Saturday. Why not cinnamon rolls and a root beer float?” The customer seemed to agree with me, and I knew it was time for a decision. I pulled a five out of my wallet and headed over to … drat. Hold on. Here comes a guy. I know this guy. Nice customer. Okay. Chat, good, chat chat, okay, oops, better help these people, dang ... It looked like I wasn’t going to get a cinnamon roll any time soon. Helping customers at one end of the table, out of the corner of my eye I saw a cinnamon roll being set down on the other end. Walking away with a wave of his hand was the customer I had babbled on to about cinnamon rolls. Now there’s a good trick. So you see, it was a nice day. A while later a family was asking me about the pieces of beeswax I sell—the fish and turtles and daisies and butterflies. I went into my spiel about all the things one can do with beeswax and it’s many fine attributes ending giddily with what has become this year’s big—drum roll, please—finish: It floats! Ta-da! Wisenheimer. Now that would be a good trick. All day people in green aprons were milling about, scribbling on scraps of paper attached to clipboards. Around one o’clock the wind picked up. It often happens this way—the weather toys with us for four hours and then in the fifth and final hour it ups the game. The manageable wind starts rattling its cage, hinting, just hinting, mind you, that it might be time for a jail break. But how do you know? How do you know that a 20-mile-per-hour wind is suddenly going to gust to 30 miles per hour, or increase to 25 miles per hour and gust to 40? There are no clouds to portend a storm, no drizzle of rain, no flurry of snow. Just wind. To hold my tent in place, I use store-bought weights, 10 pounds on each leg, which isn’t much, and two of the weights have broken so only three legs are weighted. On windy days I secure the fourth leg with a concrete block. Others use the paint cans filled with concrete or something similar. We are on pavement, so staking the tents is not an option, and the tents are not made to withstand wind, anyway. One year, in a good wind, the side braces of my tent snapped in two. These tents really are nothing more than 10-by-10-foot umbrellas, made to sail. It was about ten to two when I grabbed onto the southeast leg of my tent once again as a big gust got under it, lifted it, moved it a foot or two. Next to me, Rebecca and her crew grabbed on to their tent. There was an odd pause as the wind blew, tents stayed put, the wind blew, now harder. What do you do? Let go? Hold on? If you let go, what happens? If you hold on, what happens? How do you pack up and get out of this? Should you try moving the tent away from your table to fold it up first, before putting product away, and if so, how? Who can help? Who isn’t holding onto a tent? Or, will the wind die down so you can let go, start putting things away, get lucky, get out of there, you hope, with nothing broken. The tent next to you rises up, sails a few feet north, falls on its head in the parking lot followed by 40 pounds of concrete on a rope. You can’t do a thing to help because you think if you let go of your tent it too will fly into the parking lot. So you hang on, and as another gust of wind comes through you brace yourself and your tent and there are 30 or more others doing the same thing. Then suddenly, there is help. People come. They hold on to your tent, ask what they can do. You tell them. In a minute or two your tent is down, folded up, so now you grab on to this or that as the wind is picking up and moving everything this way and that way and in a matter of seconds things have fallen perhaps broken blown here and there but also much has been packed and stowed away safely and still people are helping or maybe they have run over here or over there to help someone else and maybe there’s a crash and more people rush over and it is two o’clock and the market is over. While one of my guardian angels finished gathering and organizing my stuff, I went to get the van. On the far side of the parking lot a wooden dining room chair skittered east to west, traveling 30 feet or more in an upright position across the pavement. It appeared from behind one thing and disappeared behind another. Okay. Is this a Fellini film? 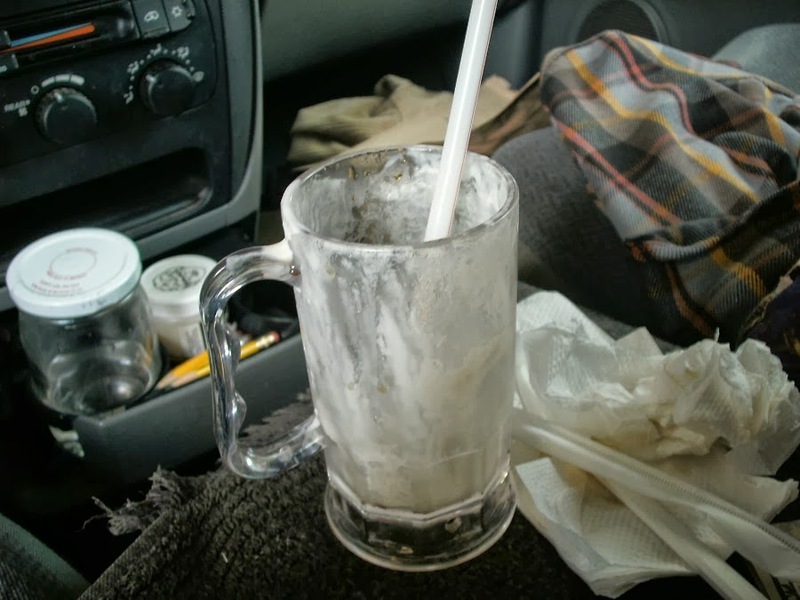 I’m ready for my last meal at The Drive-In. 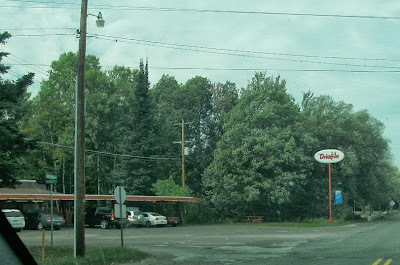 The Drive-in is off US 41 at the south end of Baraga. 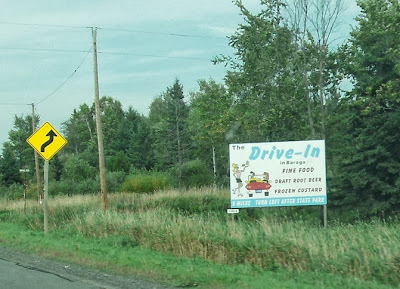 You pull in, cut the motor, roll down the window, a high school girl comes over and takes your order. Mine is a small root beer float in a mug, to start, then a fish sandwich with small fries to go. Have the root beer float first, while waiting for the sandwich and fries. Home is now only a 10-minute drive, a perfect time to eat the fries, reminiscent of McDonald’s fries, thin, a little greasy, lot of salt. If I could wait, I would dip them in catsup, but I cannot wait, and I have this vague memory of learning not to eat fries with catsup while driving. Once home, eat the fish sandwich. Earlier in the week, a big blow from my past blew through my mind, and we all know how easy it is to find one’s past on YouTube. Ladies and gentlemen, Bill Quateman.